This post may help, if you are considering setting up your own business semi- or fully professionally (meaning more or less full time and with intentions of making it a career). Instead of discussing potential pitfalls about running a small business in general - as those considerations are needed also -, I'll talk about what I've experienced about reading for money for strangers. Firstly, I've personally never found that people are difficult about payments. I display my prices on my website and people who feel it's a fair price will contact me, whereas those who don't, won't. I offer the first reading free, which gives everybody the chance to check whether my reading style is for them and whether paying for another reading feels like a good idea. At the moment, reading cards is nowhere near a proper source of income for me, it's more of a hobby and I work full-time elsewhere. So, someone could ask why I just don't do free readings. Because I'd be flooded with them. It's also a matter of fairness and principle. I'm happy to donate some of my offerings (the first free reading), but I also feel that everybody who knows their craft should be compensated for it. For a couple of years now, I've only done readings to other people via email. When I first started in 2013/14, I also offered readings at home, face-to-face, but I in the long run, I didn't feel comfortable with that. I advertised locally and realised I have no control over who picks my ad and who wants/decides to become my client. Most of my customers were completely normal people with normal problems relating to love, housing situation or work and money, but I got a few 'oddballs' with whom I did not feel comfortable. I wasn't 100% sure whether it was just their persistent/insistent/borderline obsessive method of asking questions and wanting to book more and more readings (usually about the same topic), or did I perhaps pick some vibes about not-completely-honest intentions. For example, one client came to my home for his reading and even as I pointed to the guest room / tarot room, he marched through my apartment and opened doors to check every room, explaining he was looking for a toilet. My husband was at home at the time and said afterwards he didn't like how strangers snoop our place, and I didn't feel particularly happy about that either. Furthermore, I started getting plenty of scammer calls from 'the tax office', as my phone number had now gone viral from the local classifieds site. It seemed like dodgy people in my community and elsewhere deemed tarot readers as scammers and hence, as a 'worthy' target of their own scams. Not nice. So, I stopped doing in-person readings to strangers and advertising elsewhere but on my own website. However, doing readings online and in person are two quite different skill sets. Online readings you can deliver whenever you feel like (of course within the time frame agreed with the client). In-person readings must happen when it suits the customer (although there's some discretion in you allotting time slots). Online you never need to engage in any social niceties and gauging the other person's mood, triggers etc to not accidentally offend; and you 'only' need to have a bit of story telling skills to create a meaningful story of the symbolism of the cards - I don't mean 'making up' stuff, but skills to coherently explain what separate cards mean in that particular situation. You have time to read your lines through, edit and tweak. Whereas in person, it's a lot about thinking on your feet and coming up with things to say pretty much instantly even when the cards look bad, don't promise at all what the client is seeking or are incomprehensible to you. I got a reminder of how different skills we are talking about, when I did a face-to-face reading to three close friends at once this weekend. They asked their own questions and received their own readings, but all were watching as I interpreted the cards and occasionally, made their own comments, questions and remarks of each others' cards. I did not feel challenged or questioned in a negative sense, but it does take quick wits to keep everyone's questions and comments in mind, yet deliver what I see in the cards in a manner that's comprehensible and reasonably tangible. Doing a reading in person is also mentally and physically draining and afterwards, you may feel like disappearing to recharge. I prefer to give concrete examples of the card meanings, because I find wishy-washy or overtly spiritual readings can cause confusion and anxiety. In my view it's better to give an example that's not entirely accurate than give a reading that is so ambiguous that the client can't get a handle of it, or can interpret it in any way they like (usually wrong or wish-fulfilling). This is not to try to discourage anyone, just to give food for thought for what's your own reading style, what preferences or aversions you'd have as a pro reader and whether you like social interaction or thinking through the cards in peace and quiet, then typing the meanings. Best of luck! Also, it's my birthday soon so here's a simple birthday spread to try - six cards for two-month blocks. How is my next year looking like; what will be the overall major themes? Starts from your birth month. An example spread done for myself with the Fool's Dog tarot app. In the card, a grumpy-looking old fairy fella is arguing over a nut with a squirrel. He wants to keep what's his and is very worried about losing his possession. The card came out reversed, in my view meaning he should let go of the nut. Releasing or giving away something seems to be the prevalent theme. Possibly I'll feel like others are trying to take away my resources, when in reality I can never run out - there's always more in the world to find, make, earn. This actually relates directly to my current job, where I constantly feel I'm asked for more than I can give. Worrying seems to continue. I already know that in June-July, I'll receive work-related news as my current deployment will end in June and I'm supposed to be transferred to a new place from the beginning of July, but this is all quite hazy and undecided at the moment. I hope the reversed card means the end of worrying, finding clarity about my future or at least realise there's no point in being so concerned over matters I have limited power to affect. I should go with the flow, accept what comes and make the best of it, or find a way to change circumstances that cause me anxiety. It seems I'll be quite lost in the fantasy land in Aug-Sept. It could be a good sign, as I'm also an aspiring fiction writer and one of my genres is young adult historical fantasy. I hope this card means I'll feel imaginative, immersed in the land of fantasy, and deliver some awesome fiction! It could also mean I'll be lost in my daydreams. It's always good to have some wishes and dreams in your life, but it's not always helpful if real-life solutions for something are required. This can be very literally about teaching, learning and teachers. I'm about to finish a degree at the end of the year and in Oct-Nov I'll probably sweat my a** off to finalise a thesis to satisfy my professors! I'm also hoping to start an academic career in 2019 so I could be scoping for universities. Listen to your intuition, calm down, be still and quiet, find the answers from within. This is the classic message of the High Priestess and probably a good reminder for anytime. Maybe towards the end of the year I'll have a lot of questions about my new year and the future in general and the best direction comes from the subconscious. Things seem to tip over in some way, approaching to my birthday in 2019. Temperance is a card of mix and balance, in particular of things that are inherently incompatible but need to come together for the greater good. It seems I'll have a challenge with balancing something, or pushing too hard with some matters instead of seeking a sustainable compromise. Will need to keep an eye on that! A few years back, I worked on a global online tarot site for ~ six months and was reasonably popular - got a few questions every day - but I was eventually "kicked out" for not scoring enough customers, meaning earning enough for the site. The reason could have been I wasn't willing to work harder, advertise myself everywhere; or that I wasn't willing to dangle answers and request the customer to pay extra to get the whole story. Nevertheless, during that stint I got questions from all over the world and got a great glimpse on what kind of concerns people everywhere share. The most common question I got and still get as a tarot reader is an iteration of: what should I do in situation x? Situation x can relate to work, love, relationships, finding one's passion/vocation... More than lazy solutions and windfall victories people seek direction. We all fear wrong decisions and crave for certainty on what we're about to decide, will deliver, be as promised, be The Right Choice. Normally, in a decision situation, there are options, even if one option is "do nothing". 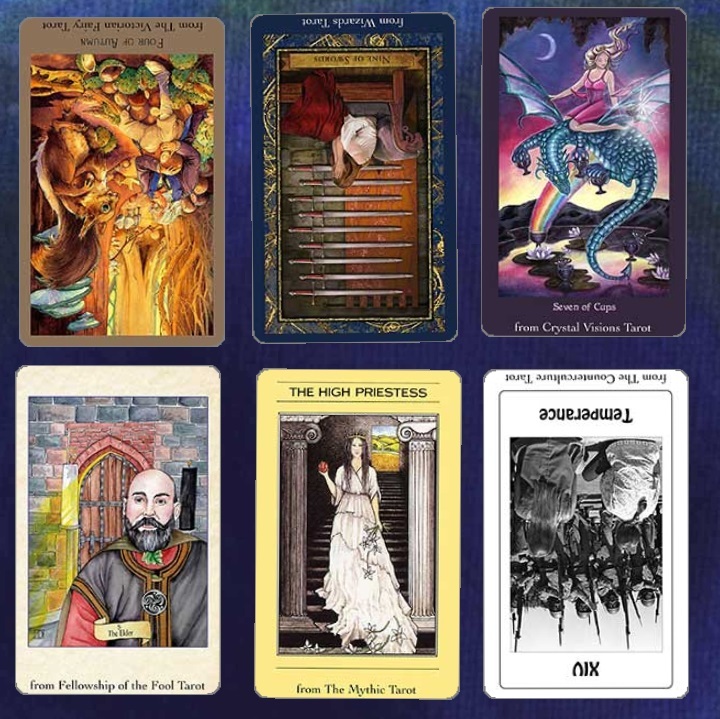 Tarot is a great tool for comparing options and potential pathways. I've found that instead of asking yes/no questions about "is this a good decision?" it's far more informative to ask: "if I do x, how will I feel [in x amount of time]?" Short and sharp yes/no questions are notoriously difficult to answer with pictures that blabber more than 1000 words. But, exploring emotions, feelings, states of being... for that, cards work beautifully. Completely regardless of whether you believe cards deliver divine guidance or simply unlock your own subconscious knowledge, this question and answer combo seem to work. Wherever the answer comes from, I've found it to be reasonably accurate. Here's a worked example of a dilemma I'm currently facing: whether to apply for a job that I in some ways feel could be a great match, but also think might make me overworked and overstressed. This card is about leaving behind an unsatisfactory situation; something you invested a lot of emotions in, but didn't deliver. This shows the ambiguity of tarot: does it mean I won't get the job (leading to a disappointment) or I'll move on in life, from an old job that clearly is not the best fit, otherwise I wouldn't be looking for anything new? Ambiguity can be a blessing in disguise. If I knew for a fact I won't get this job, I wouldn't even bother applying and perhaps wouldn't dare to try anything similar either, making me feel more stuck. When I don't know for sure, it allows a chance, hope, attempt, that in turn can help me become better at job search in general. I'd feel like on top of my game, using my wits to understand and crack problems, answer questions, find information, slice through any confusion with my razor-sharp sword of a mind. That doesn't sound in any way bad. Except... I might not be emotionally invested or committed, given that this card talks purely about logic, rationality, matters of the mind. 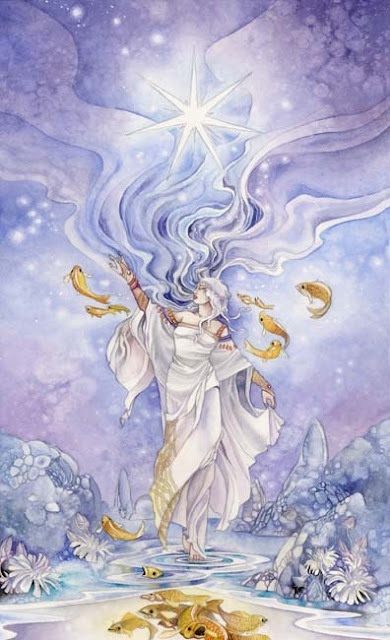 Personally, I think the Empress is the best card in the deck because it's about creation, expansion, Mother Nature, feeling blessed and happy. Job 1 is about real estate, including tackling homelessness, so I might even feel motherly, helping people find their own nest, stand on their own feet. This card has a bad rap as it's seen as the "thief" card: someone's taking what is not theirs. To me personally this card has often meant "research": gathering others' swords (thoughts and words) for my own purposes. This particular card shows a ferret arming its nest with swords - does it mean it's preparing for a fight, or just gathering resources for tough times? Either way, this card doesn't feel negative but not quite positive either. There's something underhanded in it. I'd probably be spending time looking for other opportunities: if I stay, I would still try to find something else/better. This is the family and community card. It's about belonging, feeling loved and loving, happy, living the perfect life. On the outset it looks like this is the best answer I could get: "stay, of course, you'll find happiness!" I can see this happening, as I currently have a great team, even if the job content itself is a bit draining. Feeling like an integral part of a community is very much a possibility. Comparing the Empress and 10 Cups is not easy, because they are both great. That in my view means: "either way it goes, you'll be happy". Well, isn't that just what we all want to hear about decisions! I added this question because I wanted to understand what would be the most essential element or most prominent emotion attached to job 1. The job description and advert can say one thing, but what's really going on might be something totally different. 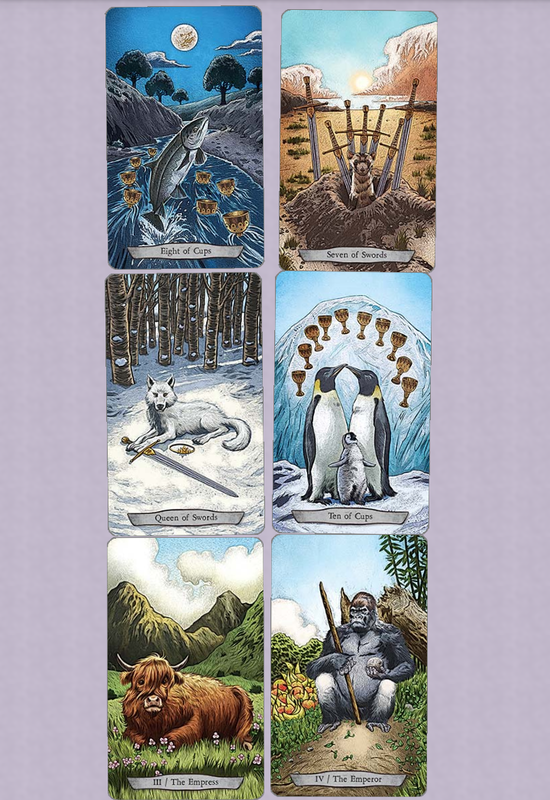 The card shows a silverback gorilla ruling over his kingdom, very emperor-like. That actually is my understanding of the job: it involves negotiating with contractors, "ruling over a kingdom", and that's the reason I'm hesitating whether to apply. I've been in a workplace that was saturated with "emperor-energy", stereotypical male traits of dominance, competition, rationality over emotional connections, and drive to win financially and materially. I'm not 100% sure I want to return to a similar environment as I found it energy-draining, meaningless. On the other hand, an emperor can also be a good ruler, just and fair leader who champions for the benefit of all his/her subjects. An interesting card - and reading - overall!